Drywall boxes - single gang. Make sure these have the little "ears" on the top and bottom of the box. RJ45 jacks and plates - get one for each port, and a couple extras just in case. Obviously, any time you start an undertaking like wiring your house for a network, you've got some planning to do. The first thing you need to do is determine which rooms you want wired. Are you doing a true "whole house" network, or are you just going to wire the office, the living room, and two bedrooms? A floor plan of the whole house is a useful thing to have at this stage, so you can sketch out ideas. Then you need to decide how many ports you want per room. In the home office and bedrooms, you may only need one or two ports. In the living room, you may want four or five ports, so that everyone can use the network together. On your floor plan, draw a small box everywhere you want a port in each room. Now that you know where you need to run the wires, you need to decide where the central distribution point will be. Sometimes, a small linen closet can be re-purposed to fit this role, sometimes it is just an out of the way corner of a large room. Wherever you decide to put it, it should be centrally located (as much as possible) to the ports you plotted on your floor plan. Now plot the paths the cables will need to run. Consider whether you have access below the floor, in a basement, or above the ceiling in an attic. Ideally, you will have both, but the time to realize where you cannot run cables is before you start trying to run them. Before you go out and start shopping, there's one more step in the planning. You need to research and decide what speed you need. 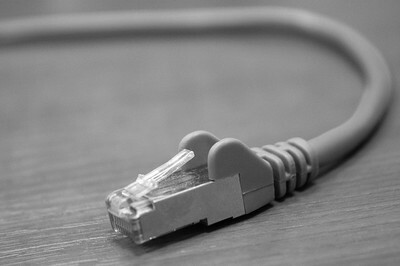 For average Internet surfing, a 10mbps switch is sufficient. However, if you are a gamer, or want to share a media library throughout the network, you'll want to spend the money to get a gigabit switch. It's a bit more money, but you'll thank me later. Find a place on the wall where there is no stud. Each box should come with a template that will help you cut the hole, so use that template and the enclosed directions for the box. You will also want to drill a large hole near the distribution point - it needs to be large enough that all the wires you are running will fit through it. Here, you'll need to do some drilling with a smaller bit, so that you can run the wire through the top or bottom plates in the wall (depending on whether you are going up through the attic or down through the basement). Pull the wire through with the fish tape, making sure to label both ends of the wire with Sharpie so you know where it runs once you connect the cable to the switch. This is where you will need to crimp ends onto the CAT6 cable. Make sure the ends line up correctly - you can find diagrams for the wire inside or on the back of the packaging for the ends. Plug the jacks into the switch and get ready to test. You can use your laptop for this step; just plug the connections into the laptop and see if you have a signal. If you don't, you'll need to troubleshoot; check the ends to make sure the wires are connecting properly where you crimped, check the switch, etc. Make sure you label the switch so you know which port goes to which connection - this will eliminate guesswork later on. 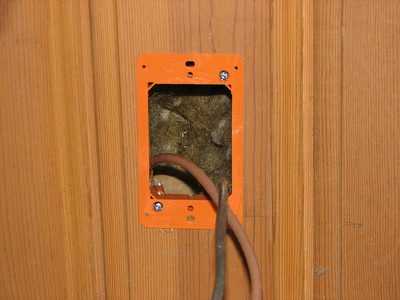 Wiring your home for a wired network can be a little bit of work, as you can see. 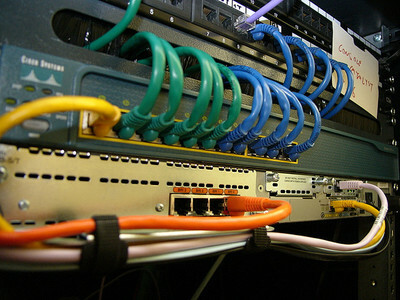 But once you've got your secured, private, high speed network up and running, you will see that it's worth the work.